Empty your pockets. When traveling through Ballarat, you’ll need the extra space for gold. In our Amazing Australia Road Trips Pt. 2, we went over 13 great adventures in the Grampians. Now we’ll head back to Melbourne after an epic Great Ocean Road adventure, but there’s still many treasures to discover on this leg of the trip. You might even find actual gold! Between Halls Gap and Melbourne is a region rich in Australia’s gold rush history, including the goldfields of Ballarat. From a spectacular local food and art scene rivaling Melbourne’s and a splendid heritage backdrop, Ballarat is the perfect stop to enjoy the finer things in life. Here are 10 adventures in Ballarat and surrounds to end your Australia road trip with a bang. After downing a few cups of Joe throughout your travels in Australia, you’ll know there’s something special about Aussie coffee. Fuel up for the day at Harvest, where the coffee maintains the Aussie standard of excellence. Fresh ingredients create a stellar breakfast menu highlighting the amazing local produce of the Grampians. Favorites include the Bubble & Squeak (poached eggs and ham off the bone on a bed of potato and vegetable hash) and zesty corn fritters. After driving about two hours on the Western Highway from Halls Gap you’ll cross paths with Ballarat. The Australian gold boom of the 1850’s completely transformed this small sheep station to a major town, now the third largest inland city in Australia. As you travel closer to the heart of the city, the legacy of Ballarat’s gold rush becomes evident in the magnificent Victorian and Edwardian buildings lining the streets. Stretch your legs after your drive and take on the heritage walking trails winding through the central heritage precinct. You’ll find some of Australia’s most beautifully preserved colonial architecture such as the impressive Town Hall and Craig’s Royal Hotel in in Lydiard Street and historic monuments and statues along Sturt Street. Step into the serenity of the Ballarat Botanical Gardens, where rows of red, yellow and pink begonias decorate verdant lawns dotted with classical statues. Towering trees providing ample shade along paved trails lead to the Robert Clark Conservatory. Here you’ll find the setting out of something in a wedding planner magazine. Hydrangeas, fuchsias and pelargoniums bloom into a spectacle of purple, pink and red hues in the summer, while autumn boasts a gorgeous begonia display. Walk down Prime Ministers Avenue past bronze busts honoring Australia’s past prime ministers, adding a unique historical touch to the gardens. Wander through the carefully landscaped lawns and find Victorian marble statues from Italy placed throughout the gardens. A highlight is the Sensory Garden, an interactive space where you can touch and smell different plants. From authentic Spanish tapas to cozy cafes with exciting menus, Ballarat’s food scene will delight any foodie. There’s no end to the delicious eateries featuring local produce – an unspoken requirement you’ll find throughout its restaurants. Grab a slice of some of the region’s best pizza at The Forge Pizzeria. This local favorite delights in crafting unique pizzas. Think slow roasted pork, gorgonzola dolce and green apple slaw on your pie, or woodfired roast pumpkin, goats cheese and pine nuts. Definitely a must for any adventurous eater. Relish in the colorful Spanish atmosphere at Meigas, where the tapas pack incredible flavors in every bite. Craft beer enthusiasts may want to hold off on lunch and explore Ballarat’s growing craft beer scene. In a city where food and drink are an experience-based culture, beer lovers are sure to find their slice of heaven in Ballarat. Get up close to the brewing process at Athletic Club Brewery, boasting an eclectic range of beer styles sure to pique your interest. Settle into one of the couches facing the beer vats behind a glass wall and sip on a choice draft brewed on site. Head over to Hop Temple, slated as the city’s craft beer mecca. Unique decor, live music and friendly staff are just the beginning of Hop Temple’s highlights. With more beers than you can count on tap and a delicious menu that stands out on its own, this gem has something for everyone. Ballarat’s mix of major galleries and smaller studios are home to spectacular masterpieces to impress any art buff. The Art Gallery of Ballarat, considered one of the best regional galleries in all Australia, draws visitors even from Melbourne. Housed in the heritage precinct of Ballarat, you’ll find an incredible range of exhibits throughout the spacious gallery. Everything that glitters is indeed gold at the Gold Museum. This informative museum is the perfect introduction to Ballarat’s gold rush history, displaying an impressive collection of gold nuggets, gold artifacts and gold coins. Discover the chronological history of the gold rush as it swept over this region of Australia, lending to the prosperity of Ballarat. Gaze over historic photos and carefully preserved articles of clothing from the era. So far we’ve only skimmed the surface of Ballarat’s heritage. It’s time to feel the rush of the gold mining excitement for yourself and travel back in time at Sovereign Hill. This open air museum is a living, breathing replica of Ballarat in the 1850’s. Walk through Main Street, lined with shops and factories showcasing rare 19th century trades practiced by skilled artisan using original machinery of the times. Learn to make your own candy, watch the processing and pouring of a spectacular gold ingot or buy a post card and send it off at the working post office. Catch a show at the Victoria Theatre or hitch a ride on a horse-drawn coach. Try your hand at firing a musket or dress up in Victorian costumes and snap a photo as a unique souvenir. With staff always in character and even a large number of actors in costume roaming the streets, Sovereign Hill feels like the closest thing to a time machine. But the one thing you absolutely must do is try your hand at panning for gold. If you’re lucky, you might get to keep what you find! An Aussie road trip isn’t complete without at least a few wildlife encounters. Ballarat makes it easy to get up close to iconic Australian animals at the Ballarat Wildlife Park. Situated on natural bush land, you’ll find a fantastic range of animals in the park, including some you may not have encountered in the wild just yet. 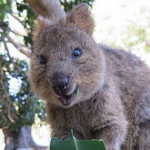 Hand feed the kangaroos roaming around the grounds, spot exotic cassowaries, meet the cute spotted-tail quolls and get to know the resident wombats. And of course – take a picture with a koala! Unwind with an invigorating mineral soak in the baths of Hepburn Springs. Just a slight detour northeast of Ballarat, Hepburn Springs is home to Australia’s largest concentration of mineral springs. This lends to the many spas dotting the area, all fulfilling their promise to end your day on the highest note of relaxation. Step into the healing warmth of mineral water with a night bath at The Mineral Spa. Intimate, adults-only and with breathtaking views into the countryside, this destination spa is one of the most acclaimed in all Australia. Our epic Australian road trip has come to an end. With countless things to see and do in regional Australia, this journey promises fantastic experiences and memories to last a lifetime. Now one of Australia’s most iconic cities awaits. With its unique heritage and a growing food and art scene, Ballarat is the perfect precursor to the stylish city of Melbourne. Want to Visit Ballarat, Australia? Ballarat holds a fascinating history and treasures extending far beyond gold for the curious traveler. 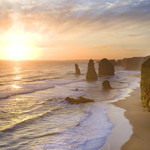 Only a short distance away from Melbourne and an essential stop on an Aussie road trip, our Destination Specialists can make the visit happen! I Want to see Ballarat!